The Force Awakens presents us with two major protagonists, an antagonist and an anti-hero. Although it re-states numerous plot points from A New Hope, it always takes care to present them in different contexts. The point of the recycling is not to remind us of a movie we like, but to reveal how everything changes no matter how much everything stays the same. The major characters in The Force Awakens, like the movie itself, are united in their desire to measure up to their forebears. Everyone in the movie says to him or her self, “You can do this, you can do this.” Like children playing dress-up, they each worry that someone is going to point at them and laugh. Anti-hero Kylo Ren has designed a badass outfit to remind people of his grandfather Darth Vader, General Hux puts on an all-black uniform to make him look like the leader he’s much too young to be, Finn takes off his ill-fitting Stormtrooper uniform and puts on the jacket of the much cooler Poe Dameron, and Rey, literally, dwells in the shadow of the original trilogy, scavenging — like the movie — parts from the ruins of the gigantic machines that fell out of the sky. To examine the narrative strategy, it’s useful to look at those re-used plot points and see how they’ve been deployed to suggest not how things are the same, but how they are different. For instance, while Rey starts out looking a lot like Luke Skywalker — orphan teen on a desert planet yearns for something more, learns to use the Force, etc — her actual storyline is much different. Let’s start with, as always, the key question: What does the protagonist want? 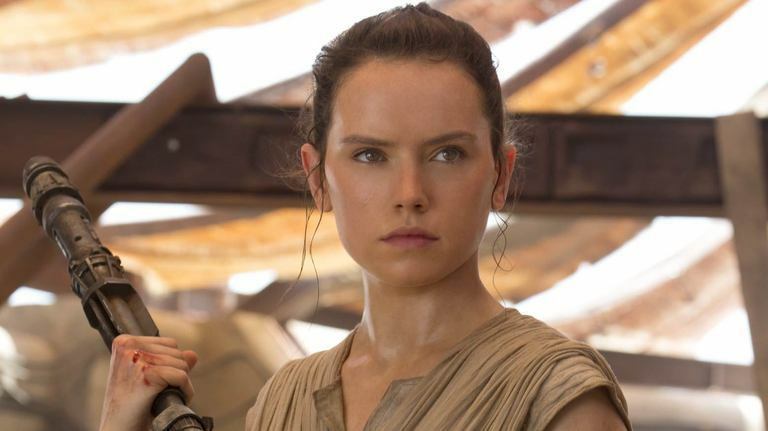 Rey, unlike Luke, does not want off her dusty junkyard planet to go searching for adventure. In fact, she says, out loud, the exact opposite: she wants to go home, because she is sure that her family will return to her. Both Luke and Rey get yanked into galactic conflict by a spunky droid, but Rey’s not a whiny dreamer looking for adventure. She’s pragmatic, crafty, self-reliant and spunky. They only thing she shares with Luke, aside from a biome and a color palette, is an interest in machines. And even there, Rey is much more of a gearhead than Luke. So let’s chart Rey’s character arc. She is a plucky scavenger on a dusty planet, an orphan who was left there for reasons unknown, and she’s afraid of growing old there but she will not leave until her family returns for her. This bouncy droid enters her life, and at the end of Act I she finds herself escaping from her home planet in the Millennium Falcon, not with Han Solo, but with a stormtrooper who has suddenly grown a conscience. Once out in space, she intends to return home but instead gets her ship swallowed up, like Leia at the beginning of A New Hope, not by bad guys but by the ship’s owner, Han Solo. Solo is not looking for stolen plans or escaped droids (Rey has, in fact, brought the droid from the dusty planet to the ship-swallowing spacecraft, another reversal of the original plot point), he just wants his ship back because it’s his. Rey quickly bonds with Han, who becomes almost a mentor to her. In fact, he would become a mentor to her if not for her stern insistence that she only wants, like Dorothy (another teen orphan girl from a dusty planet), to return home. Now, in The Hero’s Journey, a “refusal of the call” is part of the form, but Rey refuses the call well into the second act of her narrative. It isn’t until she finds Luke Skywalker’s lightsaber in the basement of Maz Kanata’s bar and has a bad acid trip that she feels any sense of destiny toward the Force. At exactly that point, she gets captured by anti-hero Kylo Ren, who tortures her (her second-act low point) and, unwittingly, becomes her pseudo-mentor. He teaches her the ways of the Force, an anti-Obi-Wan. Her third act is then about coming into her own as a Force-empowered lady, battling Ren, saving pal Finn, and escaping from a big blowing-up thing. Finally, we see her deliver Luke’s lightsaber to him, suggesting one of two things: either she has renounced her desire to return home, or else the island with Luke is, in some metaphorical way, her home. Welcome back, Todd! Can’t tell you how many times I’ve checked here for updates. And I couldn’t agree with you more on the way THE FORCE AWAKENS recycles plot points from the OT (except for the fact that JJ and company deliberately did so to remind us of why we fell in love with STAR WARS in the first place). Thanks for this. Looking forward to putting the other characters into the proper perspective. I took Finn’s commandeering of Poe’s jacket to be part of his theme of establishing an identity — he receives the mark of Cain at the beginning; he has his name thrust upon him by Poe; he assumes someone else’s (with the jacket); he lies about his connection to the rebellion (or whatever it’s called); his actual ties with the rebellion brand him a traitor among his former allies; he even assumes the mantle of a pseudo Jedi with the light saber. I had mixed feelings about the flick overall, but I really liked the idea of Finn trying to carve out his place in the world by first trying to steal an identity and then gradually coming to terms with making one. At least that’s what I came away with, and I look forward to your take. Or the jacket could just be a memorial in a callback to Gizmo’s armband from Gremlins 2. Another way to say it would be that he fakes it until he makes it. My girlfriend and I talked some about Finn and whether he would act that way given that he’s been trained to be a Stormtrooper since he was very little. Which leads to wondering what First Order troopers do in their off hours. Clearly one of the Troopers recognized him (in a nice bit of incidental character building for a character only on the screen for a few minutes) calling Finn a traitor, and dropping his blaster and shield to give Finn a much more personal beating with a plasma baton. (Trademark me, maybe.) But he knew about things like the legend of Han Solo — do First Order troopers chat about this stuff around the canteen? How much personality do they have if they’re not awakened by the Force? The jackets is a JJ Abrams thing. In his Wrath of Khan, he lands from time travel and picks up a jacket he left sitting on a chair. The answer to your question as to why she loses her desire to go home is all delivered in the speech given to her by Maz after her nightmare sequence with the lightsaber. Maz told her that the one she is waiting for will never return. (Which strongly implies that her mother is dead) But that another could. Rey asked if it was Luke. At that point Maz continued on with her speech, as if allowing Rey to confirm it herself. Rey going to Luke is Rey going home. Oh I know all that, but that’s plot, what I’m trying to examine here is purely character arcs. The plot exists to facilitate the character arc, which is outlined first, before the plot is determined. Finally caught up on these posts! Great analysis as usual — you’re spot-on in tracing all the ways that certain characters or plots will temporarily map to something from Ep IV, without ever following them through from start to finish. Poe is Leia is Han is Obi-Wan. Rey is Luke and Leia and something else entirely. Etc. I suspect that if the superweapon had been something other than a planet-destroying Death Star echo, fewer people would be complaining about Ep VII being a ripoff of its predecessor; it’s so strong of an echo that I think it drowns out the differences, if you’re not the sort of moviegoer who thinks about story structure on a more intensive level. But even with that there, yes: this deliberately nods to the original movie in a lot of ways, but it isn’t copying it. More like those story elements are Lego bricks, and Abrams is building something else out of them. I’d be curious to hear your opinion on Rey’s background, i.e. whether you think she is the daughter of Luke or of Leia (or of someone else entirely). I’ve chased my tail in circles on that one since I first saw the movie, and have tentatively come down on the conclusion I *hope* is true . . . which is that although Abrams wants you to think she’s Luke’s daughter, the “family connection” reveal in Ep VIII will be that she’s Leia’s. Watching the movie for a second time made me see all the ways the script telegraphs that as a possible connection, almost without ever pointing at it overtly, and it would make me very happy if it were true. I’m doing my best to not think about who Rey is, because I’m hoping the filmmakers have something planned that nobody is expecting. Hi Todd, I like your analysis very much and enjoyed reading it. One thing to add: What about loyalty? Luke initially turns Kenobi down because his uncle wants him to stay on Tatooine. All his choices in the first act of Episode 1 stem from his desire to be loyal to his family. It’s only when the aunt and uncle die that Luke is free to follow what he thinks are his father’s footsteps. Isn’t loyalty also a prime motivator for Rey? She bonds with BB-8 and is willing to make great sacrifices to protect the droid. Her desire to return to Jakku could also be seen as stemming from a sense of loyalty: that is where her family wanted her to stay. So maybe it’s not so much a desire to return home as it is a desire to remain loyal. When she goes to Luke at the end, she is pledging loyalty to his cause. So it doesn’t matter much how we answer the “home” question you posed. Home is an idea. Loyalty might be what makes Rey feel at home. Sorry, I was referring to Episode 4, not 1, obviously. This numbering system keeps you on your toes.